LightCorp, a leader in design and manufacturer of high-tech lighting products for office environments, announces an industry first: an asymmetrical personal task light with a mount that attaches directly to the back of a computer monitor. Part of the Tino® personal task light unveiled by LightCorp in 2014, the new lighting mount assembly kit allows the user to attach the mounting bracket directly to back of most computer monitors. It’s lightweight design, coupled with the new mounting kit, enables simple installation requiring only a screwdriver. 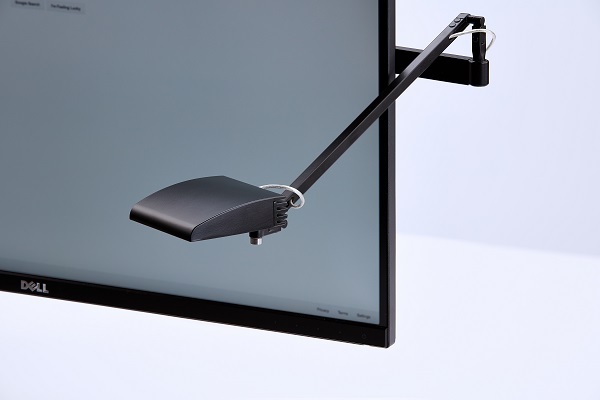 Configurable for either the right- or left-hand side of the computer monitor, the Tino® monitor mount provides the user with flexibility in positioning the light. “The versatile Tino® is designed for today’s modern, open-concept workspaces while meeting the diverse lighting needs of individual users. Because of its asymmetrical light-distribution design and the new monitor mount, the user can experience a properly lit, clutter-free work surface, even in a shared space,” Kyle Verplank, LightCorp General Manager said. The Tino® personal task light’s articulating arm and head add to its flexibility, with glare-free light emitting up to one foot from the fixture head. It’s asymmetrical lighting directs light laterally from the shade across the work area making Tino® easy to use as well as easy on the eyes. Other mount options available with Tino® include the divider mount, slat wall mount, panel mount, surface mount and clamp mount – all designed to fit into most office furniture systems.